We often make heavy weather of finding God. Speaking as if he plays hide and seek with us, or he has rules about where or how we can meet him. He felt that having a proper heart towards God would transform every act of “common business” into a medium for God’s love. It is not what we do that matters but who we are as we do it. Long before concepts like Mindfulness or de-cluttering became fashionable, Brother Lawrence followed his instinct and lived out a simple, uncluttered life. He read the bible and took the risk that it was true. He acted on what he read. Learning was painful. He spent years disciplining his heart and mind to yield to God’s presence. He struggled, as we all do, with wandering thoughts. The daily grind for Brother Lawrence was to serve in the kitchen of a Carmelite Priory in Paris. Despite his lowly position, his character was deeply attractive to those he met. His profound peace and wisdom brought people to seek his spiritual counsel. In the end he described his life as one of “inexpressible sweetness” in the bosom of God (page 37). What a great example of someone who followed the author of life to make the most of his life! We can learn a lot from him. 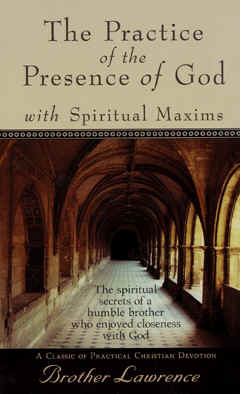 This entry was posted in Books, Resources and tagged Divine presence, God, Love of God, Religion and Spirituality, Spiritual practice. Bookmark the permalink. ← What did Jesus look like?